• Research conducted by the British Newspaper Archive has revealed a whole host of terrifying tales recorded within their collection of historic British Newspapers. Who doesn't love a good ghost story? People seem to be pretty okay with listening to ghost stories if they know they aren't real. But imagine living in an era where ghosts seemed to be a common occurrence. The Victorian era was ripe with spiritualism and, by the middle of the 19th century, there was a preponderance of people reporting encounters with ghosts in their daily lives. 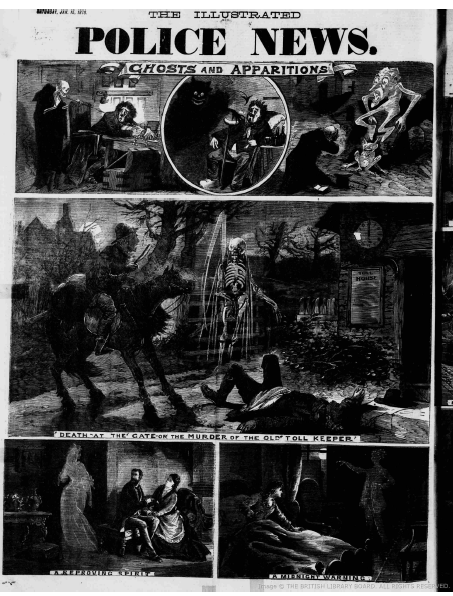 The British Newspaper Archives' collection of historic British & Irish newspapers reveal that this obsession with the paranormal was reflected in the press of the day. 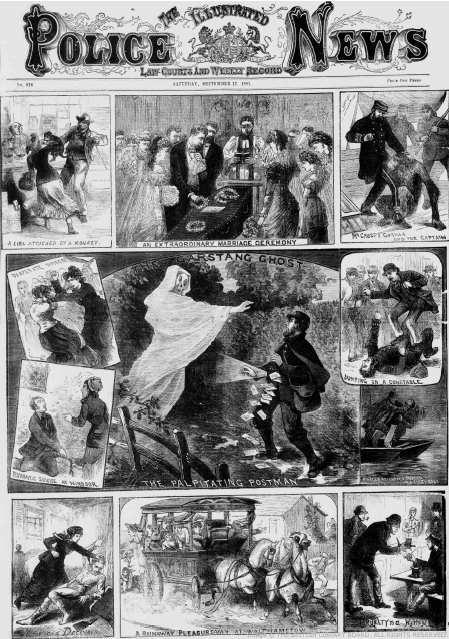 Many popular newspapers regularly printed reports of spectral sightings and ghostly visitations and one publication that did this with particular gusto was the Illustrated Police News. 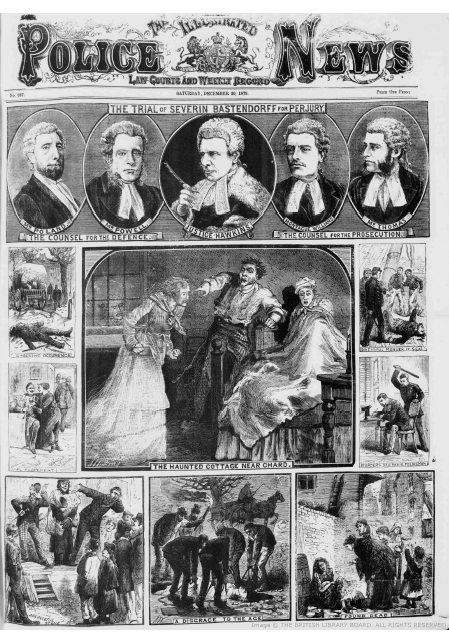 First published in 1864, the paper was one of the earliest British tabloids. 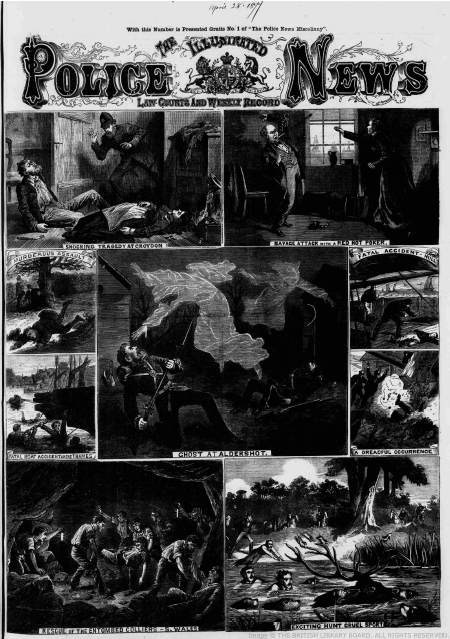 It featured sensational melodramatic reports and illustrations of crimes, tragedies and unusual events from around the country, including those of a supernatural nature. In January 1898, it was reported that a mysterious figure with "the ghastly appearance of a headless woman" was haunting an isolated crossroad outside of Buckingham. 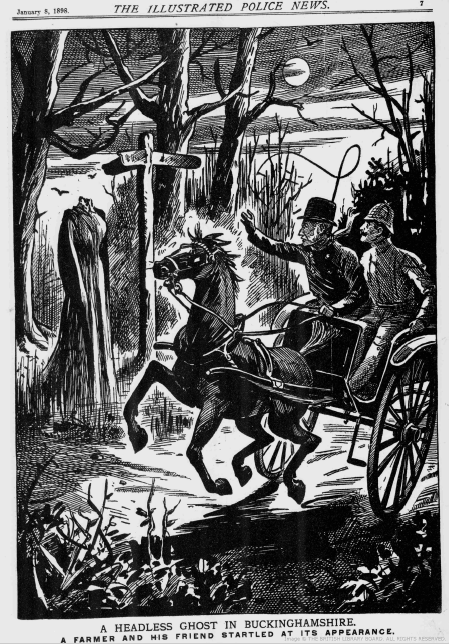 The phantom was first witnessed by a well-known local farmer and his companion who had the misfortune of encountering the wraith while driving his "horse and trap". "The night was well advanced and dark", when suddenly the farmer saw standing a few yards in front of him a black object near a weather beaten hand-post at the corner of the cross-roads. He called out as the figure was blocking his path but there was no answer and the figure remained motionless. As he got closer, he noticed the other worldly appearance of the woman and his horse began to "tremble like a leaf". In shock, he called out again "what do you do there? Move on, please". Again he was met with no response. The horse panicked and backed into a ditch forcing the farmer's companion to jump down to seize the reigns. Suddenly, "the queer visitant disappeared", but, as the pair got back in the trap to flee, the "black sombre figure" appeared again "in the same motionless position as before." "Their situation was now getting positively serious. The farmer whose presence of mind had stood him in good stead, now finding his nerve on the point of giving way, asked the apparition in the name of God to speak. Then it was that the spectra slowly drifted away, and appeared to float through the thick set bordered hedge." Numerous others later claimed to witness the ghost and the reporter commented that it was "not a little surprising that the spot referred to has been less frequented of late." "The figure in the foreground represents the toll keeper who was murdered by some person or persons unknown many years ago, and as each anniversary of his murder comes round, the ghost is said to have stood at the gates and pointed to the prostrate form on the ground. This is one of the most popular traditions of Sussex, numbers of travellers have declared that they have seen the ghost, and, so impressed were the inhabitants with the truth of the story, that the toll house was disused shortly after the murder, so that it had a neglected, weird-like appearance." "Plumstead near Woolwich, has for the week been the scene of a ghostly visitation, in which the "spirit" has appeared enveloped at night in a white away. Several children who the saw the apparition were so alarmed they have been laid up from the effect. It haunts were principally the grounds of St. James' Church and schools, where lads to the number of about 100 assembled to waylay the ghost, who was seen flitting about. The assailants hurled stones by which several panes of glass were broken, and on the police appearing, two of the ringleaders were arrested, but on being brought up to Woolwich there were discharged. One night the visitor visited the grounds of Mr J.R, Jolly, J.P., and was seen in a tree, arrayed in white apparel. The freak referred to has been traced to an individual of solid flesh living in the neighbourhood and the "ghost" has been put under restraint." In December 1878, it was reported that "an old man named Churchill was murdered in a cottage near Chard. For some time after the execution the building remained uninhabited. But at length it was let to a labourer and his family, but the incomers soon found they could obtain no rest. The state that the murderess, "Kitty", has been frequently seen to glide about the premises in ghostly attire, that old Churchill has been seen distinctly observed to look in at the window, with hideous countenance. This, added to the appearance of blood on the floor of the room in which the tragedy was enacted, supernatural movements amongst the furniture and other articles, and unearthly noises in the immediate vicinity of the cottage, so unsettle the occupants that they at last abandoned the dwelling, which is now regarded as haunted." In September 1881 it was reported that a Garstang Postman had resigned after a chilling encounter with a "nocturnal visitant". The paper reported that the facts of the case seemed sufficiently authenticated. "He was quietly perusing his way along a lonely road near the village of Garstang, absorbed in his occupation of letter-carrier, a ghost stopped his way and warned him with many mysterious signs not to continue in his present courses. The terrified postman immediately acted upon the ghostly injunction to the extent that he at once turned tail and fled." He carried away with him a very clear notion of its principle characteristics. These would seem to be abnormal stature, a horrid pallor of hue, and a variety of terror striking gestures. His description of the Garstang Ghost is borne out by the testimony of another unimpeachable witness. A young woman of the district has also had a dreadful look at the spectre. She happened also to be out in the haunted lane when evening had in her sober livery all things clad. As she walked along, perhaps in maiden mediation, not altogether fancy free, her affrighted eyes beheld the ghost. There it was, of fearsome height, clothed in white, and performing portentous movements with its arms – so she afterwards declared. This Witness testimony is invalidated to a trifling extent by her confession that directly she saw the awful sight she threw her apron over her head and ran home. Having got there safely, she instantly went to bed where she has since remained in proof of the truth of her story." The reporter went on to describe how the large group of young men were patrolling the streets in an attempt to apprehend the ghost. 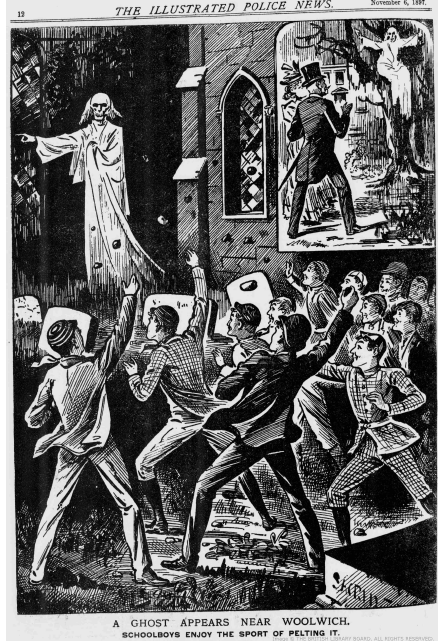 He even went as far as to blame the popularity of spiritualism for the spate of recent urban hauntings. He wrote: "It is easy to understand that a poor ghost condemned to wrapping on tables for the profit, of a very sort of social adventurer, must lose all heart for either the lighter or more serious business of its existence. The modern spirit is, in truth in bonds; its original occupation is gone, to be replaced by such undignified exercises as beating tambourines or tweaking noses at a dark séance." April 1877 – "A curious story comes from Aldershot. For some time past the sentries on two outlying posts have been frightened to death by the appearance at night of two spectral looking figures. The figures, glowing with phosphorus and otherwise alarming to the supersites, are in the habit of suddenly manifesting themselves, making tremendous springs of ten or twelve steps at a time, and, upsetting the wretched sentry before he has been able to collect himself sufficiently to oppose earthly arms to his ghostly visitants. The latter do him no bodily injury, contenting themselves with upsetting the poor man, after which they mysteriously disappear. So great has been the panic that it has been found necessary to post double sentries, and these have lately taken to loading with ball." 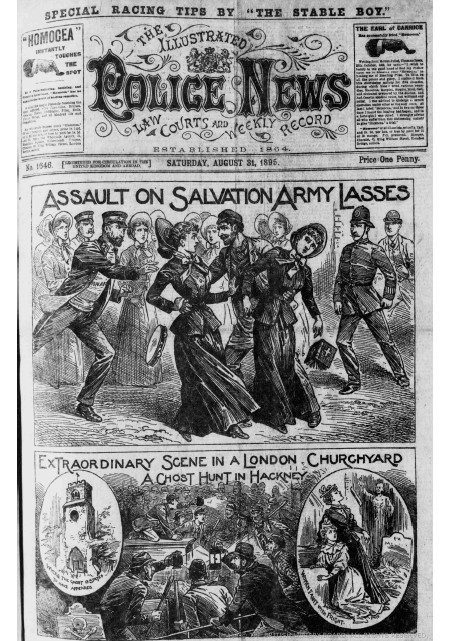 August 1895 - "An extraordinary scene was witnessed during the early hours of Wednesday, the 21st inst, in the Churchyard of the parish church of St. John, at Hackney, when fully 1000 men and women turned out from their houses in the neighbourhood to hunt for a supposed ghost. For some time, people passing through the churchyard late at night have been startled by the appearance of "a ghost". Women have fainted with fright, and the local newspapers have published accounts of the strange affair. Between ten and eleven o'clock on Tuesday night a mixed crowd began to assemble at the rear of the church, where "the ghost" was supposed to be, and where, in the usual way, scarcely anyone passes after about eleven o'clock. A long wait until mid-night, and then, as no ghost appeared, the crowd went in search of it. Armed with lanterns and candles, and carrying sticks and stones, the crowd climbed the railings from the pathways and took possession of the burial ground. Graves and tombstones were clambered over, and recently restored mounds were trampled down. A portion of the crowd looked upon the whole affair as a joke and consequently every few minutes the cry was raised of "there it goes!" and immediately the whole crowd rushed in the direction indicated. Others amused themselves by making the night hideous with imitations of unearthly cries, and although the police were requisitions to clear the place it was not until the verge of daylight that the last few stragglers went away. The damage to the graves was very great, and efforts will be made to prevent any further demonstration. Many complaints were made by those present of having their pockets picked. The tomb from which the ghost is supposed to appear is a grave at the back of the church, the stone representing three boys playing at cards on a table. The origin of this device is explained as follows: "several years ago three boys were playing cards for money, when one of them, who was losing very heavily, exclaimed, "May God strike me dead if I do not win this game". When he rose to leave the table he dropped down dead, and his ghost it is which is supposed to haunt the spot A force of about forty constables were on the scene on Wednesday night, and had much difficulty in controlling the mob, which indulged freely in horseplay." Have a happy and spooky Hallows Eve! All images ©THE BRITISH LIBRARY BOARD. ALL RIGHTS RESERVED.